This entry was posted in Uncategorized and tagged exercise, muscles, strength on August 22, 2014 by Susan. Joseph Pilates developed his breakthrough Contrology fitness concepts nearly a century ago. To explain his revolutionary exercise workouts he diagramed the importance of a physical and mental practice that, when followed, results in superior conditioning. 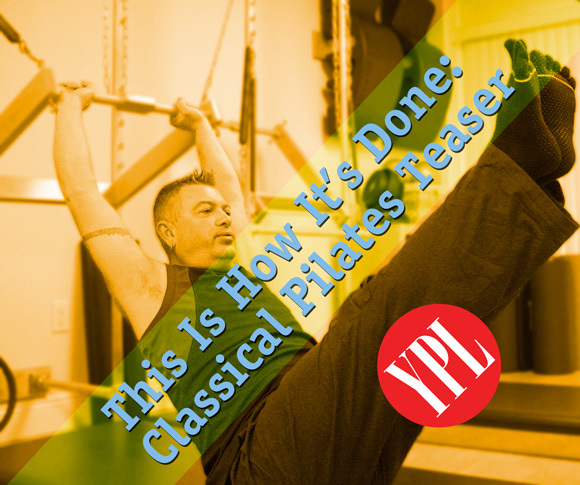 At YPL, the Classic Practice focuses on achieving the rhythmic harmony that naturally occurs when mental clarity and physical conditioning are in synch. The feeling you experience after powering through a challenging workout is one of accomplishment, control, and exhilaration. Join me for a class or session and discover how Contrology can dramatically improve your workout experience and level of fitness. This entry was posted in Uncategorized and tagged contrology, fitness, Pilates balance on August 13, 2014 by Susan. You don’t have to be a student of body weight training to get plenty of benefit from these easy to perform wrist exercises. They can be done just about anywhere, anytime, and the results could offer significant gains in your Pilates practice and everyday living. Our wrists are complex structures comprised of bone, tendon, muscle, and nerves. Keeping them loose and limber while we go about our often repetitive daily activities, often using some form of computer or tablet, is a challenge. This brief video is a great guide to keeping our wrists healthy and in top notch condition. This entry was posted in Uncategorized and tagged conditioning, exercise, wrists on July 23, 2014 by Susan. This Client Really Gets A Workout! 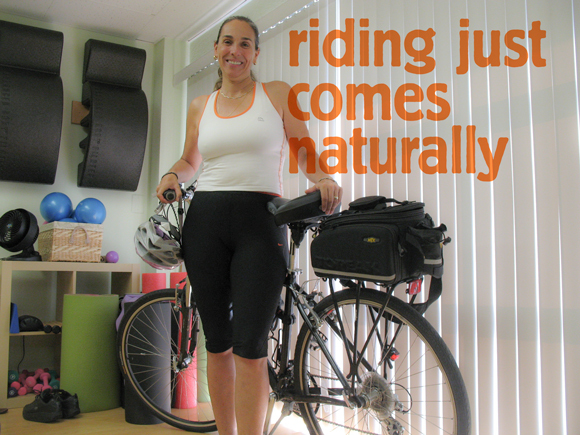 Ana’s Portuguese heritage is right at home as she cycles around the Beaches and mid-Pinellas, doubling up on her Pilates workout benefit by riding to the studio from her Madeira Beach home. Ana – “Tita” to her friends – is one of my favorite clients. This Lisbon, Portugal, native and former pro basketball player loves our weather and enjoys riding her bike the short distance to the studio from her nearby Madeira Beach home whenever she can. Ana estimates she rides 20-plus miles daily. Typical trips include the grocery, banking business, and checking her mail at the beach post office, all part of her route around town. The 2-wheeled commute to her weekly YPL workouts means crossing the intracoastal waterway, with its panoramic post card view of Boca Ciega Bay in front, the Gulf of Mexico behind, and a steady stream of leisure boat traffic passing below the Tom Stuart Causeway bridge draw span. Not only does Ana add more international flavor to the studio, her Pilates enthusiasm can be contagious. Just ask her workout partner and local friend Vinkica after they teamed up for Classical mat sessions (above). And yes, it is all about the abs! Note the extra challenge holding the ball between the knees. Although riding bikes for general transportation is much more common in Europe, Ana says she enjoys it here more than when she travels home to Portugal several times a year. She likes that she’s saving gas, helping the environment, and improving her health with this pleasant exercise every time she heads out the door. While in the U.S. her travels include trips north to Tallahassee to visit her son, currently a business and finance major at Florida State University. Meanwhile her daughter helps run the family’s businesses back home in Portugal. This entry was posted in News and tagged cardio, client, conditioning, cross training on July 8, 2014 by Susan. Tony is an excellent student determined to wring every possible advantage from his Pilates fitness program. His dedication has certainly paid off as can be seen from his excellent Teaser form. Unlike running, swimming, weight lifting or many other fitness pursuits where you’re likely to find men working out, Pilates doesn’t immediately come to mind as an option for male physical training. In reality, Pilates is perfect as a solo activity or as the focal point for a broad cross training regimen. While other exercises are easy to picture, Pilates doesn’t immediately conjure up a physical image. Ha! As we know, when done correctly Pilates thoroughly and completely challenges virtually every single part of the anatomy. And these days you’re seeing more and more Pilates being practiced at the highest levels of professional sports by athletes whose contracts depend on the flexibility and specific strength found in the program. Generally speaking, Pilates focuses on building, strengthening, and developing the core. But there’s much more than that, in a progressive training program that at the highest levels approaches the impossible. Men’s major structural weak points are tight hamstrings, hip flexors, shoulders, and chest. Pilates incorporates stretching these areas in both basic and advanced workouts, with exercises designed to loosen and lengthen the muscles and tendons that cause so much trouble for so many men spending too much time at a desk. At YPL, I don’t train a lot of male clients, for reasons that mostly stem (I think) from unfamiliarity with the routines and an overall impression that it’s mostly just for women. On the other hand, some of the biggest compliments I’ve received have come from that small percentage of men who are exploring the benefits of a full Pilates training schedule. If you’ve got a man in your life who could use a low-impact fitness program that delivers positive results quickly and safely, encourage him to check out Pilates. This entry was posted in Uncategorized and tagged cross training, fitness, Pilates on June 17, 2014 by Susan. Some of you might have already seen this but it’s just soooo cool!!! Makes me happy – how about you? Who says Pilates can’t affect your daily outlook on life. This entry was posted in News and tagged Bluebird, Classical on April 6, 2014 by Susan. When we talk about Controlology, we’re referring to the connection between the mind and the body. That connection is important whenever we’re performing our Pilates movements, and it’s essential when practicing the advanced moves on our apparatus. Whether you’re a Pilates professional or a first time beginner, this video from Munich’s Bluebird Pilates Studio is a perfect demonstration of what that connection means and why it’s so critical in our practice. And before anyone asks, no, I don’t teach these exercises at Your Pilates Lifestyle! I’ve included this clip just for inspiration for your own Pilates practice (but definitely not for comparison purposes!). Whatever level you work at the principles are the same -concentration and control (mind/body connection) being an integral part. Deepen the work by being fully present in each exercise you perform and make it the best that YOU can make it! This entry was posted in Uncategorized on March 6, 2014 by Susan. Do You Know The Difference Between Pushups? This entry was posted in Uncategorized on January 6, 2014 by Susan. Pilates keeps you warm on the coldest days! It’s a brand new year and those resolutions are still warm even if the weather outside isn’t! Make this the year you make fitness part of your daily routine. This entry was posted in News on January 2, 2014 by Susan.